1993 SP Baseball continued with the hobby's growing fascination with premium products. And while the bar has continued to be raised, 1993 SP Baseball is a reminder that high-end wasn't always about autographs and memorabilia. The set also has one of the most iconic rookie cards of the 1990s. 1993 SP Baseball has a simple checklist consisting of 290 cards. It kicks off with 18 All-Stars. These cards look very similar as other player cards but have an All-Star notation at the top. These players aren't repeated in the main set. The main part of the checklist is organized by team. The key portion of 1993 SP Baseball comes at the end of the set. The final 20 cards make up the Premier Prospects subset, which features several rookies. Included in this group is the Derek Jeter rookie card, which has emerged as one of the top rookie cards of the decade. Johnny Damon's best rookie card is also in 1993 SP Baseball. 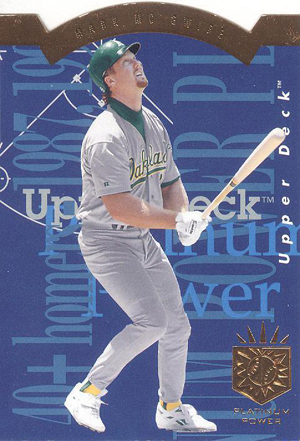 Chipper Jones and Manny Ramirez are among the Premier Prospects that aren't rookie cards. The Premier Prospects are extremely condition sensitive. The all-foil fronts are prone to chipping. Any corner wear is also very noticeable. This makes high professional grades from PSA and BGS extremely rare. The 1993 SP Baseball design is fairly simple. Largely borderless, the focus is on bright photography. A thin stripe at the bottom of the card has the player's name and position. A bronze foil SP logo is just above the nameplate on the right. A thin foil line extends up the right side, going toward the top where it forms an arch, which is where the team name resides. A small two-color bar is in the top-left corner. The set's only insert set is Platinum Power, which features 20 of the game's best home run hitters. The cards have a busy, stats-based background and a die-cut top. Platinum Power cards are inserted 1:9 packs. 1993 SP Baseball boxes have 24 packs of 12 cards. 1993 SP Derek Jeter #279 RC Gem Elite Graded Pristine 10 L@@K! 290 cards. Cards 271-290 are "Premier Prospects" and have a foil background. 20 cards. Inserted 1:9 packs. Nice looking set plus the Jeter Foil RC. Must-have for baseball card collectors. 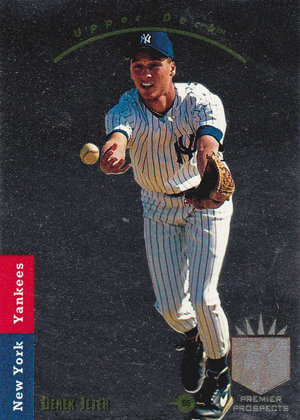 DEREK JETER 1993 UPPER DECK SP ROOKIE #279 BGS 8 W 9.5 Centering!